New session ka agaz ho raha hy. Is saal hum 9th, 10th k liye aik new book likh rahy hain jo k 9th, 10th k liye likhi ja rahi hy jis main assan alfaz main tamam batin byan ki gai hain. Ye kitab Urdu aur English Dono main avail hy. 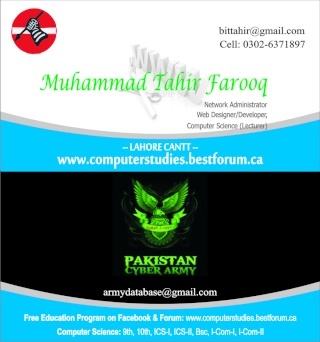 Computer Science Studies (BIT) :: Questions :: Any Question About Computer Studies????? ?